Corollas at Stevinson Toyota West in Lakewood, Colo., in November 2010. Toyota's biggest-selling model is facing unprecedented competition in the U.S. market. LOS ANGELES (Bloomberg) -- When Doug Hacker of Milford, Ohio, began shopping for a small car recently, he figured the model he'd end up buying was a foregone conclusion. A self-described "Toyota guy," Hacker was inclined to go with Toyota Motor Corp.'s workhorse Corolla. The venerable compact is the Japanese automaker's No. 1 model as well as the world's best-selling car of all time, with cumulative sales from 1966 through last year surpassing 37 million units. Well, the spell has been broken, at least in Hacker's case. After testing the Corolla, he was disappointed by the car's old-fashioned four-speed automatic transmission and the absence of a gas-sipping direct-injection fuel system. He decided to buy Ford Motor Co.'s 2012 Focus instead. "I could not believe how outdated everything is," on the Corolla, he says. Toyota has commanded headlines for much of the past year due to voluntary recalls of more than 8 million vehicles for everything from faulty fuel pumps to floor mats that could make accelerator pedals stick. Yet the world's largest automaker faces another less noticed challenge: the aging of its biggest-selling model. Last updated in 2008, the current Corolla, which starts at $16,360, is the 10th generation of a model introduced more than 44 years ago. It isn't scheduled for a makeover until at least 2012, say industry analysts; the company is mum on a date. Meanwhile, a new crop of feature-laden small cars from Ford, Honda Motor Co., General Motors Co., and Hyundai Motor is arriving. Unlike the Corolla, these compacts offer popular features such as voice-activated controls, high-tech transmissions, and connections to computer networks. While the Corolla - including Matrix hatchbacks built on the same platform - managed to retain the top spot among U.S. small cars in 2010, sales fell 10 percent, to 266,082. The brand ended the year just 5,864 units ahead of Honda's Civic. Analysts expect a more challenging environment this year, thanks to Hyundai's hot-selling 2011 Elantra and a revamped Civic that's due out in May. "Corolla has always had a tough place in the market. It's never been a style leader," says David Champion, director of automotive testing for Consumer Reports magazine. "The new cars coming out offer more style and content. They're really going to give Corolla a run for its money." While the Civic remains Corolla's biggest rival, the 2011 Elantra is drawing attention for its flashy design, better fuel economy, and lower base price ($15,500) than the Corolla or the Civic. Meanwhile, Ford's new Focus compact, Kia Motors' Forte, and Mazda Motor's Mazda3 are catering to U.S. buyers' interest in more stylishly designed small cars. The Focus seeks to attract buyers who want more European handling than the Toyota offers. Even GM, never a leader in small cars, is grabbing sales with its new Chevrolet Cruze, which boasts superior fuel economy and power relative to Corolla. 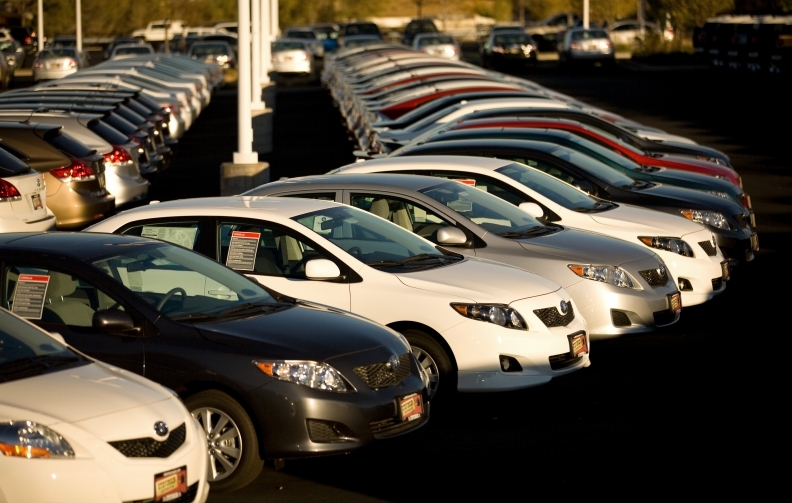 "It's a small-car tsunami this year," says Jessica Caldwell, director of industry analysis at researcher Edmunds.com. "The only thing Toyota can count on is loyalty to the Corolla name." Toyota's small-car leadership is at risk as competitors add technology and features to small cars, where sales have long been fueled by price and fuel efficiency alone, says James Bell, an analyst at industry forecaster Kelley Blue Book. "With Elantra, Focus, [and] even the Chevy Cruze, people are going to see what the standard is, and see that a compact car is no longer a penalty box," Bell says. Bob Carter, group vice-president for Toyota brand sales in the U.S., recognizes the challenge. "The market is getting more competitive," he says. "I have a deep respect for Cruze, Focus, and Elantra." Still, he says rivals have their work cut out for them. "When you come to Corolla and the heritage and loyalty behind it, that's a lot for a competitor to overcome," says Carter. The Civic, the top U.S. small car until Corolla toppled it in 2003, poses the toughest challenge. Final details are being kept secret until closer to the model's May debut. Honda officials aren't gloating, at least publicly. Having Civic outsell Corolla "is not something we're chasing," says Christina Ra, a spokeswoman for Honda's U.S. unit. "There was a day when that was a goal," says Ra, but no longer. To further the Civic's appeal to buyers seeking fuel economy, Honda is adding a conventional model that will deliver more than 40 miles per gallon in highway driving and is replacing the car's current hybrid version with a model using a lithium-ion battery pack. Automakers facing such stiff competition typically maintain sales volumes by ramping up production and rolling out marketing incentives. Toyota can't easily do either. Last year, its joint venture factory with GM in California—the biggest source of Corolla production in North America—closed. A new plant in Mississippi won't start building Corollas until late this year. Until then, Toyota is getting cars from Canada and "importing some Corollas [from Japan], just filling in gaps," Carter says. That's an expensive proposition, given the yen's high exchange rate. Such are the dilemmas facing Toyota with a model that's showing its age.